I absolutely loved Chris Eccelston as the ninth incarnation of Doctor Who. But, because he only starred in the role for one season, there weren't a lot of tie-in media that featured the Ninth Doctor. There were a handful of novels, and that was about it. I always thought this was a huge loss. The Ninth Doctor seemed to have a lot more story to tell, especially since he was the incarnation of the Doctor that had just survived the Time War. I was actually at the New York Comic Con panel where they announced that they would be doing rotating mini-series featuring the older versions of the Doctor. I am really glad they started with Chris Eccelston's Doctor. It was especially a bonus that Rose and Captain Jack Harkness would be featured in this mini series too. I am going to say up front that Titan's Doctor Who comics can be hit or miss at times. There have been quite a few stories and issues I've really enjoyed, and quite a few that I thought were forgettable. I think part of the problem, especially for the Tenth and Eleventh Doctors is that they are trying to fill in lost chapters that we didn't even know existed. New companions, new storylines, all that had to fit in-between all the stories we've already seen. Titan avoided that trap here and gave us a story with Rose and Captain Jack set right after the "The Doctor Dances." It actually makes a lot of sense that The Doctor, Rose, and Jack had a lot more adventures than the 3 or 4 we got to see on TV. The characters all seemed to have a pretty tight bond by the time Jack is "killed" in the season finale. Cavan Scott did an excellent job getting the characters right, especially The Doctor. I was able to hear Chris Eccelston's voice so clearly as I was reading this issue. The Ninth Doctor always felt very mysterious and often brooding, and you can feel that in this comic perfectly. I did think that Captain Jack seemed a little more toned down than usual, but that actually does fit the time frame from when this issue was from. Captain Jack didn't go full "John Barrowman" until Torchwood and his later appearances in season 3 and 4 of Doctor Who. I also thought the art was great. We got another brilliant cover by Alice X. Zhang, and the interiors were terrific as well. And it wasn't just that Blair Shedd got the main characters right (though he did). The aliens they encountered ACTUALLY LOOKED ALIEN, so huge bonus points for that. The setting was also real well realized through the art. I especially liked the last planel where Rose is lost in space. You get a true scale of the epicness of space and how small one person is. As for the story of this issue, The Doctor wants to show Rose and Jack the most beautiful planet in the universe, but it turns out it has been destroyed. The Doctor finds himself in the middle of some kind of war between whoever blew up the planet (they sort of looked like robotic gazelles) and massive armored beings. The Doctor tries to reason with them...Jack tries to blast them. Neither approach works. So they finally decide to flee. But as the TARDIS fades away, they realize they left Rose behind. The story wasn't bad at all, but I did think some of the players involved could have been more clearly spelled out. I know the writer was trying to create tension and mystery, but it definitely tilted more towards frustration than tense in a few places. But for the most part, this was a real well written comic. This was a great way to bring the Ninth Doctor back. I really hope that this book is a success and opens the door for more stories featuring other incarnations of the Doctor. That said, between TV, books, and comics, all of the other Doctors (including the Eighth Doctor who despite only one TV appearance had a ton of books) have had a lot of time in the spotlight. So I want to see more of the Ninth Doctor. AND more than that, I also want to see more of the War Doctor and his experiences during the Time War. 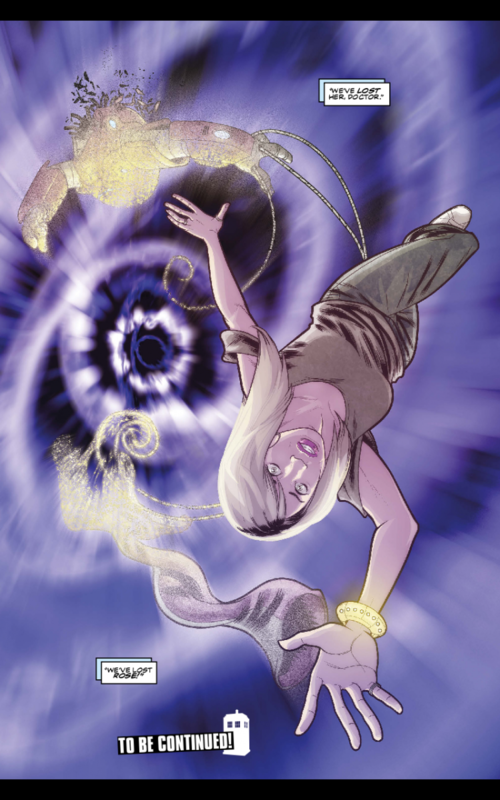 Alice X. Zhang is my favorite comic artist! Did feel a little confusing at times. Is it worth your $3.99? 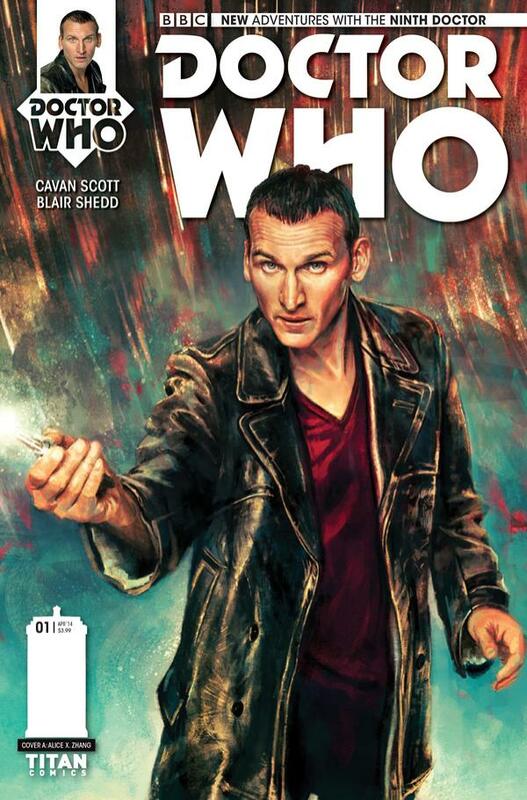 If you like the Ninth Doctor as much as I do, this is definitely worth your time and money. Definitely one of the better licensed stories I've seen from Titan.